Compassion Ministries - Who Did It? 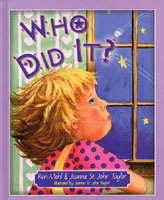 Ron Mehl and Jeannie St. John Taylor, two widely-respected authors, team up to create this vivid, passionate book that will have children and their parents echoing Job's awestruck statement, "My ears had heard of You, but now my eyes have seen You." Combining vivid artwork with powerful text, drawn from the questions God asked of Job, this book presents the awesomeness of God in an uncomplicated, child-friendly style.